America Revealed: Where Is Our Money Going? We will be discussing this as one of the stories - 05-21-12 - Breaking Taboo - Newdissidentradio.com - 7:00 PM EST - Be sure to tune in. The United States is looking at a National Debt of over 16 Trillion Dollars and climbing every day. Even though We the People are continuously taxed, fined, assessed and overcharged for goods and services, this debt continues to mount. The powers that be in government are trying to convince us that this debt is a result of social “entitlements” like Social Security, Medicare and Medicaid; all funds we the taxed masses pay into from our personal, hard-earned income. The question which constantly arises in this author’s mind is; if We the People are being forced to pay more and more into the governmental matrix but are constantly being told this nation is operating in the red, where exactly is our money going? Our “leaders” insist we must balance our fiscal budget by cutting “waste” like food stamps, aid for the homeless, veteran’s health care, Social Security, Medicare and education (to name a few) but in these discussions and their attempt to sedate those who will be most hurt by this anti-American mentality, nary a mention has been made to the real problem of the ever increasing, military industrial complex. The Republicans blame Obama for the ever increasing deficit but all on the campaign trail this past year (save for Ron Paul) vowed to continue to increase military expenditures in the name of National Security and the “War on Terrorism”. In 2010, the budget for military expenditures was nearly $800 Billion dollars. This number did not include foreign aid to countries like Israel and others for their military or the amount sent to nations to maintain our over 80 bases around the world; an additional $500 Billion. In total, America spends nearly $2 Trillion per annum on the CIA, FBI, the Pentagon, an increasing, domestic police state, Foreign “Aid” and its aggressive, global military presence. All told, the War in the Middle East post 9-11 has cost this nation over $8 trillion dollars and the associated military machine globally, another $4 trillion. 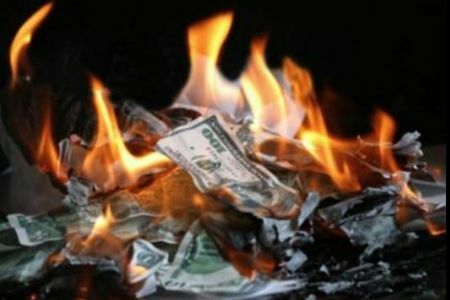 The proponents of America’s emerging austerity measures tell us taxpayers that in order to reduce our national debt, we must abandon or rather, forget that we have paid for those programs mentioned above. Our government representatives and their media minions claim it is because “liberals” want a free ride but it has become all too apparent that the only free ride being offered is to the monetary contributors to the same politicians selling their snake oil. As funding is being cut for education, social outreach programs and efforts to quell an increasing poverty level, our “leaders” are working tirelessly to enable provisions for other areas of our “National Interests” like Corporate Welfare, Resource Wars and Bailouts for the biggest of Congress’ Corporate donors. Anti-protest Laws, nationalistic programs to watch us citizens like drones to patrol our borders and our towns including an increasing Police State, subsidies for oil and gas companies and bail outs for “Too big to fail” corporations are where our tax dollars and our quasi-national interests are being directed. When the question arises of where our money is going and how we are going to balance and eventually, decrease our deficit, those who cry, “foul” should look first at America’s own global brand of terrorism costing us all our financial and national security before insisting We the People must sacrifice our futures and our children’s. Unless we rise up and resist this devastation, this nation will soon join the historic ranks of empires no more. If you want to know where our money is going, look no further than to the greedy and immoral in Washington and those occupying our State Governments where the only interest they seem to have in mind, is their own. Look around you...Where do you think our money is going and then ask yourself: Are you willing to saddle your children and their children after them with the cost of these expenditures?